I have practiced law in California since 1974. I was the legal advisor to the City of Martinez Police Department and the City of Martinez in 1974-1975. I have been in private practice since 1976 with a special emphasis on handling personal injury and wrongful death cases. 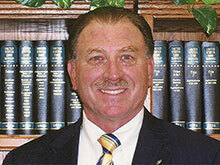 I also handle criminal defense with emphasis on DUI cases. I have recovered hundreds of thousands of dollars on behalf of my clients over the past 40 years. I have served as an arbitrator/mediator on numerous cases. A.B. from the University of California Berkeley, 1970. J.D. From the University of California Hastings College of the Law, 1973.